Phishing at The U - New Scam to Look Out For! 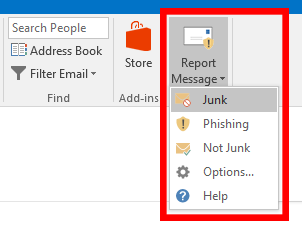 Report Suspicious Emails with the New Outlook Feature, "Report Message"
Through a new feature offered by Microsoft, you can now report suspicious emails and phishing attempts through the quick and easy "Report Message" tool within Outlook on your desktop or online. Identify and select the Report Message (!) button located on the upper-right corner of the Outlook ribbon, as shown in the image below. Select the category of suspicious email (i.e., junk, phishing) and confirm your selection. Log in to your UM email at: email.miami.edu. Identify and select the Report Message (!) button located on the upper-right side of the Outlook on the Web message information panel, as highlighted in the image below. Select the category of suspicious email (i.e. junk, phishing) and confirm your selection. When uncertain about the nature of an email, please utilize this new feature to report the email at your earliest convenience. It is proven that fast and precise reporting of suspicious emails reduces the overall success of malicious phishing campaigns within an organization. By enabling this feature, UMIT aims to continue our fight against cyber-attacks through education and awareness. We value your diligence for recognizing, addressing, and reporting suspicious emails. For more information, please feel free to contact the UMIT Information Security Office team at: ciso@miami.edu.